On Monday, the Supreme Court gave the president a symbolic victory, and an unknowable number of refugees a life-changing defeat: The justices lifted the injunctions that lower courts had placed on Trump’s travel ban, allowing the administration to begin barring visitors from six Muslim-majority nations — and refugees from anywhere in the world — from entering the United States. The court will hear the case on the policy’s constitutionality next fall. But since the administration’s ban is temporary — lasting only 90 days for visitors, and 120 for refugees — Trump will be able to implement his plan before that legal fight commences. The idea here is that the ban should not cause harm to American residents while its constitutionality is in limbo. And barring a Muslim Iranian-American citizen from being visited by a relative from her home country — while allowing a Christian German-American to enjoy that privilege — could, potentially, constitute such harm. The justices further stipulated that a “close familial relationship is required” to meet the “bona fide relationship” standard. But the words “close familial” still give the administration a lot of room for subjective interpretation. 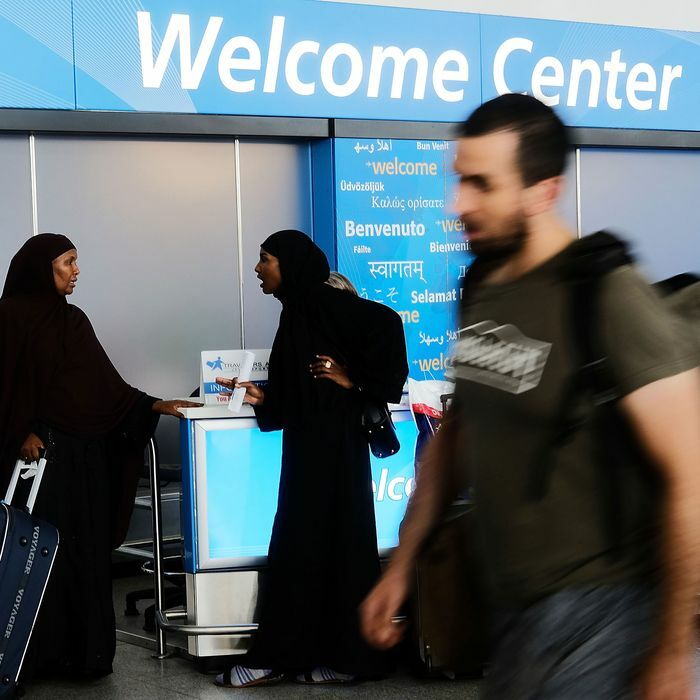 On Thursday, consular officers granting visas to immigrants from any of the blacklisted nations — Libya, Iran, Yemen, Syria, Somalia, and Sudan — will begin asking applicants to prove that they have such a relationship with a legal resident of the United States. Anyhow, it shouldn’t be possible for the administration to botch the implementation of the new policy as spectacularly as it did back in January. Then, the administration sowed chaos throughout America’s airports by barring immigrants with active visas and green cards from entering (or reentering) the country. By contrast, any immigrant with an active visa will still be allowed to enter the United States — as will any refugee who was scheduled to be resettled in the country before July 6 — even after the limited ban goes into effect tomorrow. And green-card holders were exempted from the administration’s revised travel ban months ago. Still, even if it triggers little discord in airports, the new ban is bound to create conflicts in courtrooms over what does and does not constitute a “close familial” relationship.